The 10 Best Doughnut Shops in Wisconsin! Doughnuts rank among the most popular of America’s favorite sweet treats. It’s hard to beat sprinkled, frosted, and glazed doughy goodness. And nothing quite compares to the smell and down-home quality of your local doughnut shop. Wisconsin is home to some of the best. Enjoy warm doughnuts in a warm atmosphere at these 10 great doughnut shops in the state. You can smell the sweet sugary, goodness of Greenbush Bakery from two blocks down the street. Check out Madison’s favorite doughnut shop. While Greenbush doesn’t have tables for conversing, stop in, order a bunch, and enjoy at your leisure! 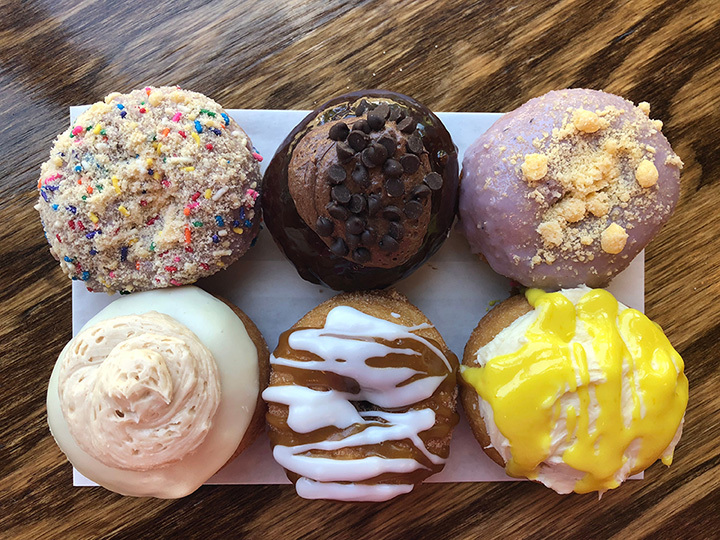 Flavors upon flavors of different doughnut combinations can be found at Holey Moley. Try their doughnut and frozen custard sandwiches—a crowd favorite, for only $6. Who hasn’t heard of Manderfield’s famous bakery? More importantly, their doughnuts. With three area locations in the Fox Valley, their inventory is always stocked up. Raised doughnuts, cake doughnuts, and doughnuts holes—the gang’s all here! Since its start in 1975, Honeydip has been a staple in Milwaukee. Honeydip Doughnuts are the perfect way to start off your day. Noted for not only their doughnuts but their breakfast combination of coffee and a sweet treat. Singing Donut in Fish Creek is the perfect place to stop in for a cup of coffee and their famous doughnuts. Sprinkles are a thing in the past—unless you like the traditional (they have that too.) Dip in chocolate, drizzled in raspberry, and topped with your favorite candy bar or childhood cereal. This family-owned bakery has been serving Western Wisconsin since 1973. Tons of sweet treats and doughnut flavors can be found at Linda’s. Taste the difference that family-owned and community-loved can have. A Dozen Excuses Donuts? There are hundreds of good excuses to stop in to this spot. Doughnuts, sprinkles, cream, raspberry filling, chocolate, glazed, custard, sugar, blueberry, frosted, and cinnamon. On top of that coffee, cakes, and other goods. Since 1954 Lane’s Bakery has been sweeping the people of Madison off their feet. They are local and family-owned delicious doughnut destination. Pick out tasty traditional favorites or try their seasonal bakery items that come around every so often. Taste what made from scratch means at Augusta. Some bakeries have lost their touch of high-quality ingredients and delicious homemade treasures, but Augusta holds on strong and offers up some of the best around. From cake doughnuts, Christmas items, and coffee, try all of their crazy doughnut creations. For the past 80 years Hill Top Bakery has been serving up doughnuts and bakery items from scratch. This spot has long been a family-favorite snacking place in Kaukauna. With no preservatives, fresh ingredients, and good old fashioned recipes—you’ll love the doughnuts at Hill Top.